A blog about Life in the Royal City. Minimalism: A growing, helpful trend in right-sizing your life. Do you ever feel burdened by your belongings? Look around and wonder how you accumulated all that you have? Wonder what you’re going to do with it when you move? Our possessions are meant to serve us. To provide us with their utility. To make our lives easier. As we mature, and find ourselves with the most financial freedom to accumulate, we find it’s also the worst time to do just that. These possessions often serve us the least, and occupy space we could otherwise downsize from in our 50’s, 60’s and beyond. 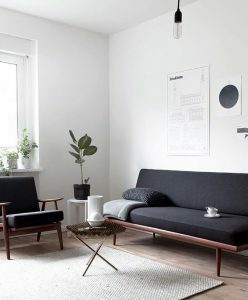 Minimalism, then, has taken off- both in style and sensibility. It’s reflected in our modern housing choices, our decor style, and how we live. After a generation of working to accumulate possessions, we’ve collectively realized that we wound up trying to accomodate our possessions and not the other way around. One of the most challenging parts of a move for seniors, is working through boundless possessions. Establishing what still serves a purpose, what can be sold or donated, and what is simply worthy of disposal; all the while navigating the sentimentality of each item. It’s often an arduous process that takes place at a time where there are other stresses and challenges compounding the move. In fact, an entire industry has grown out of Canadians being overwhelmed by our “stuff” – the move assistant, or downsizing expert. They offer invaluable services when it comes to sorting, packing, and removing possessions in preparation for a move. The easiest solution though, shown time and again, is to try our best not to accumulate so much along the way. The following interview with Rachel Jonat, with Dave McGinn from the Globe & Mail offers a great window introduction to the minimalist mindset, and how to ease into minimalism without stressing over it. For the full article, click here. Minimalism has become a very popular idea over the past several years, but is there still something intimidating about it as a lifestyle? Oh, for sure. I think just the word “minimalism,” people think they’re going to have to give up everything they own. My take has always been you can do this to whatever degree you want. What is the big appeal of minimalism? What’s the payoff? For me, the big appeal is not caring so much about what everyone else’s plan is, and not buying in so heavily to, “I’m 36, I need to own this and do this.” The big appeal is having a card that says, “I don’t have to do that.” It’s okay not to have everything and not to want everything. How do you deal with the anxiety of getting rid of stuff that you think you might one day need? It is scary. But solutions come to you, especially in this sharing culture. We’re getting so much more savvy about using what we have and using services and sharing goods. So it’s not as scary any more to get rid of things. For people who are uneasy with going straight into the deep end, what’s a good way to wade into minimalism? Reading up on the minimalist movement is a good start. That can make you enjoy what you already have more. You realize that you do have enough. That’s the exciting part, is hitting a point where you’re quite content with what you already have. I really like your idea of even starting with just one space in your house that can act as a minimalist oasis. It’s especially important too when you have a spouse or kids and you can’t always control every room in the house, and it can’t always look the way you’d love for it to look. So even if you can’t have a room, if you feel like, “I’ve got control of my home office desk and I’m always on top of it and there’s a place I can go and sit and feel at peace,” that’s a win, for sure. You say in the book that you should get rid of anything you own that’s too nice to use, but do you think people will part so easily with their fine china, or other such items? It could be a beautiful sports coat that you’re only going to wear once or twice a year because it’s so nice. You spend your time and money working for those things. You should enjoy them as much as you can, or sell them. The book suggests adopting “peaceful” decor. Can you be a minimalist if you like a really loud colour scheme? On that point, what’s a good rule of thumb to go about minimizing your space – when do you think enough is enough? A good one for me is always, “Do I feel like I can pick up my home in an hour or 90 minutes? Can I get it in good enough shape that someone I know will be looking in every corner and I can invite them over?” It’s when you’re beyond that control, where you’ve got so much out that if you wanted to tidy up but it would take your entire weekend, that’s when you’ve really got to scale back.